Stokefield House was until recently used as the name of the Council Offices in Castle Street (see the photograph at the bottom of the page). The building in 2015 stands empty. The original house on this site was built for Adrian Stokes on a paddock that he bought from Joseph Parslow by indentures dated 28th and 19th 1821 and included property acquired from Benjamin and James Smith also in 1821. Until the local Council took it over and used it as offices in 1958 it was a private residence for a succession of influential families. The photograph on the left shows Stokefield House when it was Council Offices owned by Thornbury Rural District Council. 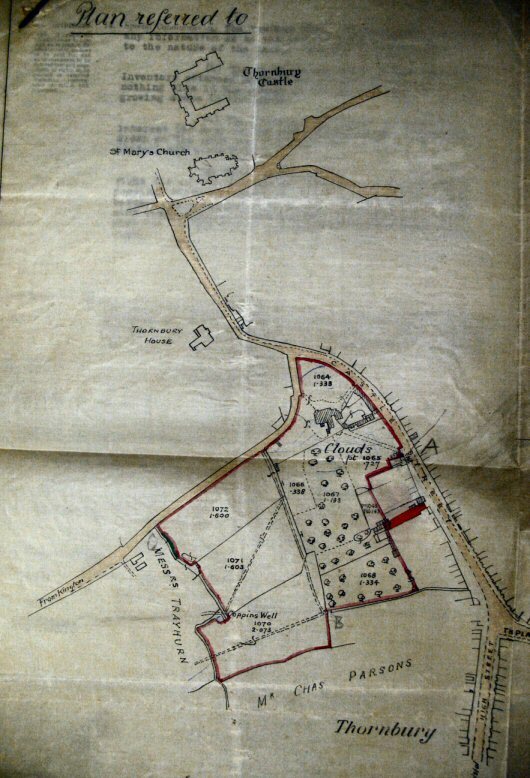 In the early land tax records the property was described as “Stokes.” The first reference to the name “Stokefield” as applied to the main house appears in the will of the late Mrs. Eleanor Rodney dated the 4th March 1868. In 1915 Lady Madeline Jenkinson bought the house and renamed it “Clouds.” We believe that it was only called “Clouds” during her occupation. From 1827 to 1832 at least the rate books show that Adrian let the house to Caddell Holder. At the time of the 1854 sale the house was said to be in the occupation of Major Hume. William Charles Woodbury Hammond and Anita Mary Budd Leigh Walker 1927-1930. On 28th September 1927 William Charles Woodbury Hammond of Walden Llantarnam Newport and Anita Mary Budd Leigh Walker of Leeds, William Reginald Haldane Jenkins of Marlwood Grange and George Rowe of Lincoln’s Inn Fields were involved in a conveyance of Clouds formerly Stokefield House from Georgina Isabel Jenkinson. We do not know why this couple bought the house but William Hammond was divorced by his wife Ivy in 1929. They sold the house on 3rd November 1930 to Captain Dutson. William John Francis Dutson 1930 – 1958. Captain Dutson of Grove Lodge, Stoke Bishop in Bristol bought the property that comprised Stokefield House and its associated land from William Charles Woodbury Hammond and Anita Mary Budd Leigh Walker. The thumbnail image on the right shows the property at this time. Please click on it for a larger image. We believe that William John F Dutson was born in Bristol in 1895 and that he was the son of William Dutson, a tea traveller of Bishopston and his wife Edith. He seems to have married Dorothy Huddleston in 1921. The FreeBMD website shows that the births of four Dutson children with the mother’s maiden name of Huddleston were registered in the Bristol area. Unusually they were all called John; “John G” in 1922, “John D” in 1924, “John A H” in 1925 and “John K” in 1928. When William Dutson bought Stokefield, his address was given as Grove Lodge, Parry’s Lane Stoke Bishop in Bristol. It seems that Captain Dutson was a farmer whilst at Stokefield House. When the Vine House in the High Street was put up for sale in 1950 it was made clear that the two closes of good pasture land belonging to the Vine House were let to Captain Dutson. The records of St Mary’s Church show that on 24th September 1949 John Derek Dutson (presumably the second of the four Johns referred to) a farmer then aged 25 married Patricia Audsley of Fairfield House in Castle Street. The youngest son, John Kenneth Dutson married Sheila Gell in Solihull in 1955. They lived in Rockhampton. Sheila’s obituary in The Gazette explains that Sheila was born in 1923 in Solihull. The obituary said Sheila was a “perfect English lady” and described her life in some detail. Mrs Dutson had been involved in many voluntary roles – governor of Thornbury Grammar School and Marlwood School, Justice of the Peace, Councillor of Rockhampton etc. During the war she returned to England from America in 1942 on a Dutch cargo ship with the intention of helping the war effort. She joined the ATS as a radio location corporal and served in various anti-aircraft batteries in Bristol and around England. 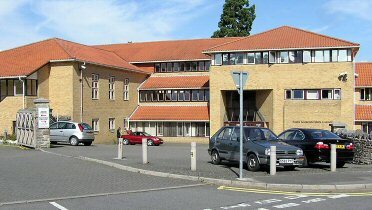 Kenneth Dutson died in Frenchay hospital in 2009. His funeral service took place at St Mary’s Church in Thornbury. Thornbury Rural District Council 1958 -1974. Thornbury Rural District Council bought from William John Francis Dutson the building known as Stokefield and sometime as Clouds and 10.342 acres of ground, including Latteridge on 29th September 1958. 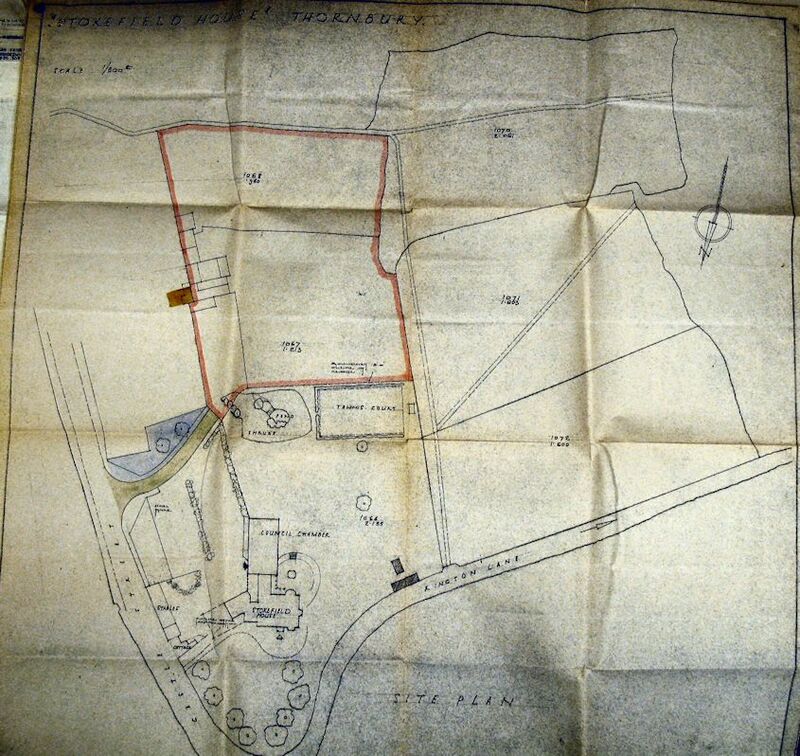 Of the total area of 10.342 acres, the Rural District Council sold off 2.15 acres (the land that was d eveloped to build Stokefield Close) in 1959 to Robert Watson and Co. (Structural Engineers) for £2,400. On the left we have a thumbnail image of the property when it was first owned by Thornbury Rural District Council. 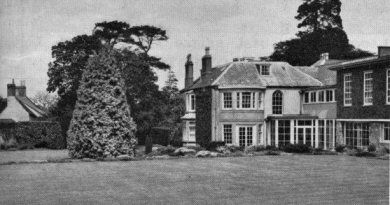 The photograph shows that the house was clearly “in transition”- still recognisably a large and attractive house but with quite ugly additions to make it suitable for office use. This view into the property from Castle Street would now be unrecognisable to the more recent Thornburians. During the period that it was owned by Thornbury District Council the building was extended as can be seen both from the photograph at the top of this page. The plan, a thumbnail image of which is here on the right, shows both the land that was sold off for the housing development known as Stokefield Close and the alterations that were made to the old Stokefield House. Northavon District Council 1974- 1996. Northavon District Council was created in 1974 under the local government reorganisation of the time. On the 4th November 1985 work commenced on the construction of new civic offices for Northavon District Council. During the construction the property now known as “Stokefield House” was demolished. The building (shown here on the right) now occupying the site looks rather different from the original Stokefield House. In 1996 the greater part of Northavon District Council was merged with Kingswood to become part of South Gloucestershire Council.